WELCOME TO ADMIRA DHES INC.
Admira Distributed Hybrid Energy Systems Inc. (ADHES), is based in Toronto, Ontario, Canada. Admira’s primary focus is “Hybrid Energy Systems Technology“ Research and commercialization. Admira’s US location focuses on Renewable and Hydrogen systems, specifically Hybrid solutions for the Energy needs of an organization. Admira Provides energy efficient solutions which promote renewable and sustainable technologies. 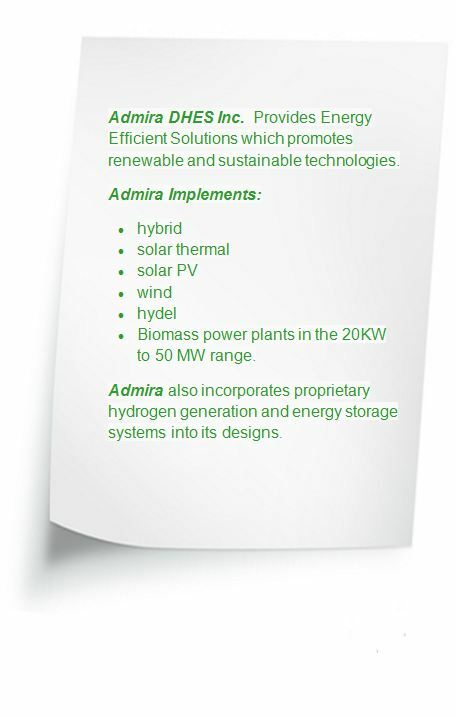 Admira-implements: Hybrid, Solar thermal, Solar PV, Wind, Hydel and Biomass power plants in the 20 KW to 50 MW range. Admira also incorporates proprietary hydrogen generation and advanced energy storage systems into its designs. Admira’s objective is to generate 20% of a company’s energy requirements through renewable technologies. This will reduce the carbon footprint, reduce water consumption and promote energy independence, with the opportunity of creating more green jobs. Admira’s research also provides innovative water usage solutions through high purity ozone technologies researched by industry experts/world leaders on their team. Admira’s Potential customers are building complexes both residential and commercial,factories, energy farms and most industrial complexes looking for ecologically-friendly solutions for their energy needs. Technologies such as, Solar Photovoltaic, Solar thermal, Wind, Biomass and Mini/micro hydel would complement such projects ideally suited for markets in South-West USA, Canada, India, Asia, the Middle East and Africa. We are currently negotiating the implementation of 3 Hybrid Power Plants in the 20 KW – 50 MW ranges. We will also integrate a unique Hydrogen energy generation and regeneration technology which will include the design and development of a proprietary omni-axial and omni-directional wind-wave turbine with a superconducting energy storage system. ADMIRA is working with the University of Western Ontario and Centennial College to develop a modular distributed hybrid power plant, based on a green hydrogen fuel. The Cell/IC engine power plant is working on a novel Sugar/Carbohydrate rich effluent to green hydrogen and a methane gas generator. The first module has been built and installed. We are also designing and building a 125 KW and a 76 Dish solar thermal hybrid system for companies in Canada, USA and India. Incorporated into our design is a unique thermal storage and receiver. The research, development and commercialization prototype building will introduce systems ranging from 20 KW – 50 MW in a distributed hybrid modular solution which will be funded by the National Research council of Canada, to the tune of $350k. The R&D at Western and Centennial will focus on developing a commercial prototype, which can be replicated in a modular manner for the above applications in the 20 KW – 50 MW ranges.